These are the unforgettable outfits of Rachel Green that we wouldn’t mind borrowing (and probably never giving back). In an interview with Vogue, Jennifer Aniston got to talking about ’90s fashion comebacks. She reflected fondly over squared-toe loafers and high-waisted jeans, both of which she has held on to since her Friends days. 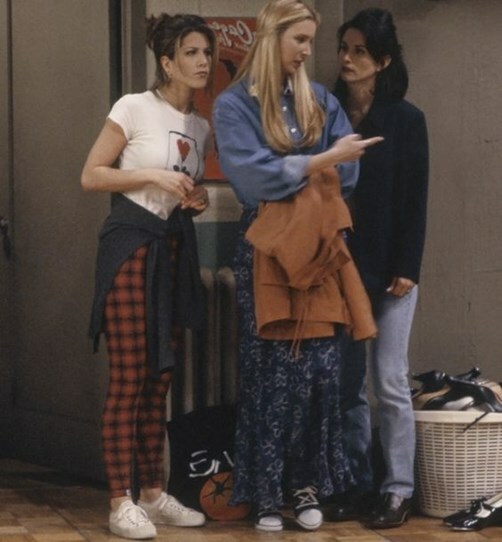 Naturally, this got us thinking about all of the outfits her character, Rachel Green, wore on the show and how we would TOTALLY still wear them today. She mightn’t have pursued the ’90s grunge/goth vibe typical of the era as seen on the likes of Winona Ryder (still epic) or the minimalist route à la Kate Moss (also still epic), but Rachel Green was relatable. Whether it was girl-next-door denim vests or the preppy and popular mini skirts, there’s a shade of Rachel Green in all of us. Starting with this khaki mini-skirt and perfectly fitted tee combo. Checkered pants and chunky white sneakers? Um YES please! Speaking of checks, does anyone know where we can get ourselves a gingham mini dress these days? A coloured turtleneck for every day of the week is literally our Autumn/Winter mantra. She was all about the layering... and now, so are we. How could she possibly be upset when she looked this good?! The shirt. The shoulders. The neck tie. The flares! She was from the future and she didn't even know it. Florals and stripes and cutouts? The perfect choice for summer vaycays. Now we just need a fancy event to go to.. There are those classic high waisted jeans she's still got hiding in her wardrobe, which we will soon be adding to ours. Could this plaid skirt BE any more adorable? Note to self: tie up all blouses around waist from now on. Just when you thought overalls were on their way out, Rachel goes and convinces you otherwise. She sure knew how to wear a tank top better than anyone else. Also, those cropped pants and loafers are giving us life! A denim vest as a top? Genius. Even the miniest of mini skirts look chic on her. Actual real-life bridesmaid dress goals. Seriously, who else could make knee high leather boots and pleated mini skirts look this good? NO ONE, THAT'S WHO! Forget leggings! It's all about trackie dacks. And what is a perfect, every-day outfit if not for a striped mini dress with a leather jacket thrown over your shoulders for good measure?